REUTERS/Fred Dufour/Pool; Alex Wong/Getty ImagesChinese President Xi Jinping and US President Donald Trump. 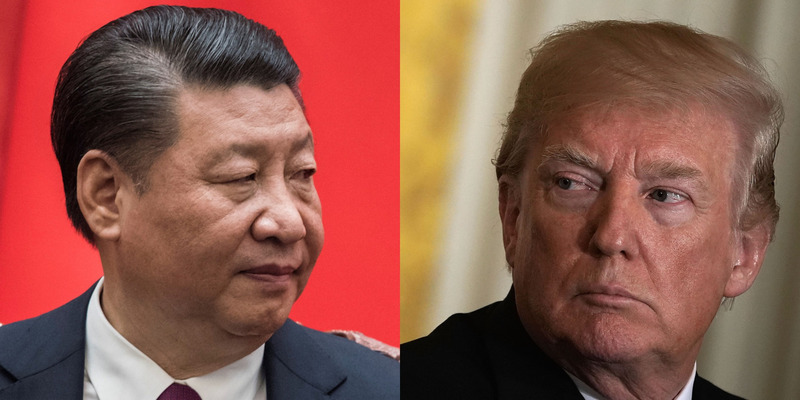 China hit out at President Donald Trump on Tuesday, accusing him of “bullying” over his aggressive tactics in the trade conflict between the two nations. It warned, however, that it was ready to “rise up” to an escalated trade war. “This unyielding nation suffered foreign bullying for many times in history, but never succumbed to it even in the most difficult conditions,” Commerce Minister Zhong Shan said. Separately, US Treasury Secretary Steven Mnuchin said his department continued to monitor China’s actions regarding its currency, the renminbi. China’s government has hit back at the Trump administration, accusing the US president of “bullying” over his aggressive tactics in the trade conflict between the two nations and saying it will “rise up” should things escalate further. “China doesn’t want a trade war, but would rise up to it should it break out,” Zhong Shan, China’s minister for commerce said Tuesday in a statement. So far, the Trump administration has placed tariffs on $US250 billion worth of Chinese goods, affecting more than 5,000 products. President Donald Trump, however, has said he is willing to “go to 500” – a colloquial term for placing tariffs on all US imports from China. What was initially seen as an empty threat is now viewed by many observers as a genuine possibility after the latest round of tariffs were announced in late September. Zhong said such threats would not lead China to back down and offer the US concessions. “There is a view in the US that so long as the US keeps increasing tariffs, China will back down,” he said. “They don’t know the history and culture of China. “This unyielding nation suffered foreign bullying for many times in history, but never succumbed to it even in the most difficult conditions,” he continued. Zhong’s comments came just a few hours after Trump again accused China of taking advantage of the US over trade. “We can’t have a one-way street,” Trump said Tuesday afternoon during a press event held to discuss the resignation of Nikki Haley as the US ambassador to the UN. Alongside increasing tariffs, communications between the two sides have become more and more strained in recent weeks.China in September called off planned talks between midlevel officials, and this week Secretary of State Mike Pompeo exchanged displeased words with Chinese Foreign Minister Wang Yi during a trip to Beijing. “Recently, as the US side has been constantly escalating trade friction toward China, it has also adopted a series of actions on the Taiwan issue that harm China’s rights and interests and has made groundless criticism of China’s domestic and foreign policies,” Wang said at a press conference. Away from the escalating tensions over trade, the US Treasury has shown new concern about China’s devaluation of the renminbi, an action it believes Beijing is using to strengthen its hand by making Chinese goods cheaper. “As we look at trade issues there is no question that we want to make sure China is not doing competitive devaluations,” Treasury Secretary Steven Mnuchin said in an interview with the Financial Times published Wednesday. Trump has frequently criticised China for his belief that Beijing is artificially weakening its currency to make Chinese exports more competitive, something he says China is doing to hurt the US economy.